~ Now that your child is in school, they are more involved with numerous activities that involve balance, coordination and large/small muscle control. We will continue to enhance these tools through a variety of indoor and outdoor activities such as: throwing at targets, running, jumping rope, tumbling, and aerobics. ~ Friends are becoming an important phase of your child's life. Encouragement of skills development and self-actualization are imperative to this stage of growth and development. We will develop skills in self-esteem, self-discipline, responsibility, belonging and trust. ~ Many children are now worried about fitting in with friends and how others are viewing them. By encouraging positive interactions and learning about rules, your child will explore new ways to interact. 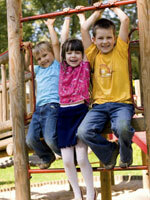 They will play games and interact with one another developing strong interpersonal skills. 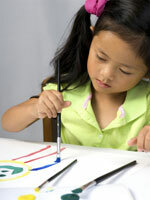 ~ Many school agers have verbal skills that match adults. They are able to put ideas in written form, as well as, in artistic form. We will provide an atmosphere that will help develop these intellectual skills by integrating math, science, computers, reading and language into your school agers stay with us. We know it is very important for you that your child does well in school. They can come to our center after school, get help with their homework, and have fun while doing it.